The transition from elegant Little Lord Fauntleroy suits, kilts, sailor suits, and dressy short pants to casual blue jeans and baggy trousers for boys is an interesting study in social history. The mod boy of today would hardly recognize his counterpart of 100 years ago who might have found himself outfitted in a delicate lace collar and fancy velvet knee pants, sailor suits, or kilts. Parents at the time dressed formally and insisted that their children also dress smartly to reflect well on themselves and to demonstrate their social status. Gradually styles changed in the mid 20th Century to more realistic short pants and knickers before the modern incarnation of sneakers, casual baggy jeans and sweatshirts. Parents, especially mothers, used to choose their sons' clothing and until they were older teenagers, the boys had little say in the matter of fashion. 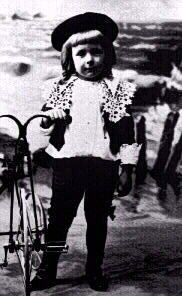 Children, especially well off children, were often dressed in fancy, formal clothes--even for play. The modern child would find clothing common a century ago highly restrictive and uncomfortable. It would certainly inhibit an active child who wanted to enjoy the playground in the comtemporary scene. The modern child, even very young children, have a great deal of say in how they dress, often demanding expensive designer clothing. Today children are major arbritors of fashion and even very young boys have considerable influence as to what clothes are purchased for them. Many also have considerable disposable income, either through alouances or for teenagers, part time jobs. The fashion industry understands this very well and eagerly seek to supply what they than the modern boy desires. Informal styles are now in vogue with children rarely dressing up and, in many cases, only under considerable duress. Figure 1.--Mothers in the late 19th century dressed their boys in Little Lord Fauntleroy suits, fancy velvet suits with lace collars. Often the boys had curls or long hair and to ballance such fancy outfits they would have their picture taken with decidely boyish artifacts such as a toy cannon, or in this case an early tricycle. The images in this web site depict the clothes which reflect the modes and manners of the times in which they were made and worn. They will hopefully delight the eye and also touch the heart. The clothes from the more recent era will no doubt recall some associations and many memories from the readers own childhood. I hope it will bring back treasured memories from yours. I certainly hope you will share some of those memories with us. Our web page takes a look at the development of boys clothes over the past 500 years, from 1500 to date. First and foremost we describe actual fashions and styles. In some ways boys' clothes have made a full circle from clothes just like their fathers with no consideration to childhood to special juvenile styles after the late 1790s back to dressing children in adult styles since the 1960s. Our web site is, however, not just a fashion site. We also seek societal changes over the years have been reflected in changing fashion. We also attempt to capture what the parents (mostly mothers) and the boys themselvs thought about the fashions of the day. There frequestly was some disparity between what mothers and boys have wanted. Only in the modern era, however, have boys generally gotten their way. This web page is divided into several major sections. Most are still under construction. In fact, our site is likely to stay in a continual stage of construction as visitors contribute there own personal experiences as well as historical insights. We incourage you to peruse all the available sections. Please let us know if you have any comments or additional information to add. Perhaps you are knowledgeable about a specific style or period. Surely you know something abour current fashions. Maybe you have read a biography with interesting details about how famous person was dressed. Or perhaps you recall a movie or television show acurately depicting period dress. We would be especially interested in any memories you might have about your boyhood clothes and experiences concerning those clothes. Any of this would make an interesting addition to our web site. Trouble with reading English? Please go to our translation pages, just click here for translations in Deutch, Espanol, Frances, Itlaliano, y Portuguese>>>>>>>Translations. Please let us know if these translations are accurate and readable on your computer. If sufficent interest is shown we will develop additional translasted pages. Of course you know that you can translate pages of interest on Altavista. Art: We have developed detailed information on art work, including paintings and illustrations, of children by different artists in several different countries. Catalogs and magazines: Biographical details Here we have archived information from catalogs and mazines in various decades from a number of different countries. Chronologies: Review the evolution of boys' clothing styles over the past five centuries with a special emphasis on the period after 1800 up to modern days. Clothing styles: A review of major clothing styles and boyhood memories. Countries: Information about boys clothing styles in countries all over the world. We welcome input from readers on their country. Girls clothes: Some basic information about girls clothing. Here we would like to partner with someone iteresting in expanding our still limited coverage. Hair styles: We have developed information on a wide range of hair styles and trends in different countries. Frequently Asked Questions: Here are the answers to questions you have been asking about our site. Links to clothing retailers: HBC has been asked by so many visitors for retail outlets that offer classic children's clothes, that it has decided to begin a list. We are just beginning, however, to compile our list. If you know of a company offering classic, traditional styles, please let us know. New pages: HBC is constantly adding pages to its expanded site, now one of the largest fashion sites on the internet. Click here if you would like to see what we are currently woring on. Thank you for your interest in this web site. I would be very interested in hearing your comments. I am looking for any historical material, articles on clothing, interesting pasages from biographies/autobiographies, old-time photographs of your family, even personal remberences of the more modern clothing styles, or any other pertinent material. Perhaps you have some interesting ideas about further additions. I would greatly appreciate any new material you could provide. I know many of you will not have historical information, but we all have photographs and remember some of our favorite and least favorite boyhood clothes. This web site is still under construction. In fact it is a living document, growing as visitors provide additional information and photographs. Quite a bit of work to be done. Check back soon for several new additions. Mailing List: HBC had an active mailing list which all contributors can request. If you are interested in a periodic update on our work on HBC, just send an e-mail to HBC asking to be put on our basic mailing list. We will then keep you informed of major HBC projects! It couldn't be more simple. Thank you for your many kind comments about my web site. I have also greatly appreciated your many helpful suggestions and fascinating contributions. In fact, I have received so much new material that I can no longer accomodate it on this web site. I have decided to create a new web site incorporating the material here with more detailed historical data and discussion, more photographs, paintings, drawings from catalogs and magazines from each period, more personal remeberences, synopsis of movies showing period dress, and biographical information on what various historical figures and current notables wore as boys. As you may know, graphics require a huge amount of disc space. As a result, I could only put a relatively few photographs on this web site and no drawings or paintings. This precluded the use of much informative material. In particular I was unable to include images from before photograhy was developed and refined--because of the size of the files. Many paintings from the 18th and early 19th centuries will, however, be included in the expanded site. I now have the expanded web site up and functioning. Come have a look. There are now nearly 500 pages and over 700 images. Details on the new Boys' Historical Clothing expanded web site and how to acess it can be obtained by clicking here >>>>> BHC Expanded Site. This Antique Photograph Ring site owned by HBC.